Just when you thought it might be safe to fly again, here comes United—which has surely been cursed by a vengeful wizard—with another PR catastrophe, and also a tragedy: the death of a very large and good bunny named Simon in transit. We've covered the work of Spiotto before, and love his Little Golden Books-esque covers depicting various geeky favorites as adorable children's books. You can check out even more of his work over at io9, and if you want to see these covers in person, and will be in the Los Angeles Area, you can check out his exhibit, Storytime 3 at Gallery 1988 East in Los Angeles this weekend! Get ready for 37 seconds of pure bliss. Monday Cute: FLOOFY BUNNIES ARE FLOOFY! OMGOMGOMG, I can't even with these Angora bunnies. Just LOOK AT THIS THING. It is a ball of fluff - the definition of cute. What's more, they're apparently a super-chill, laid-back breed of bunny that pretty much just sit there looking adorable. No, Google, I asked for "2015 Hot Buns Calendar." This is the cutest 2015 cosplay calendar and I dare you to prove me wrong. Seriously, try, that sounds like a win-win situation to me. Meow the force be with you. Things We Saw Today: I Chews You, Pikachu Burger! Pikachu burger uses Bun-der Shock! It's super effective! As delicious as it looks, I kinda feel like I wouldn't be able to eat this burger from the pop-up Pikachu café in Tokyo. Instead I'd probably just let it follow me around while I eat food shaped like other Pokémon. "There's some action goin' on up in here." -- The guy on the right. Sure, Easter's over. That's no reason we can't all have a good laugh at this clip of a newscast from WBIR in Knoxville, Tennessee wherein some bunnies get to work making more bunnies right there on the news desk. The guy on the right isn't having any of it. Dude on the left though? Loves it. Easter is just about bunnies, right? Bunnies are probably some of the cutest critters to ever grace us with their fluffy adorable presence. However, they're not always so cute in video games -- in fact, they're often depicted as deadly and even lusty creatures. With Easter on the way, Zoomin.TV wants to treat us to their top 5 bunnies in gaming. We didn't do a Monday Cute yesterday, because there was a Game of Thrones trailer to run and we have priorities. 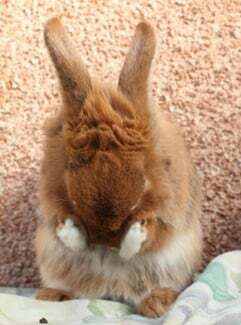 And we can't do a Tuesday Cute—the very idea—which is good, because this video of a girl at Japan's Ōkunoshima (aka "Rabbit Island") is enough to make one's blood run cold. Hasn't this lady heard what rabbits can do? (via: Jezebel Are you following The Mary Sue on Twitter, Facebook, Tumblr, Pinterest, & Google +? What, no Donnie Darko? Ah, that's OK. It's in the Honorable Mentions. I can forgive its exclusion because a supercut that includes Monty Python, the Muppets, Harvey, Watership Down, Space Jam, and Fred Astaire is a beautiful thing. Are you following The Mary Sue on Twitter, Facebook, Tumblr, Pinterest, & Google +? Etsy user Catherine Boucher has a delightful imagination. 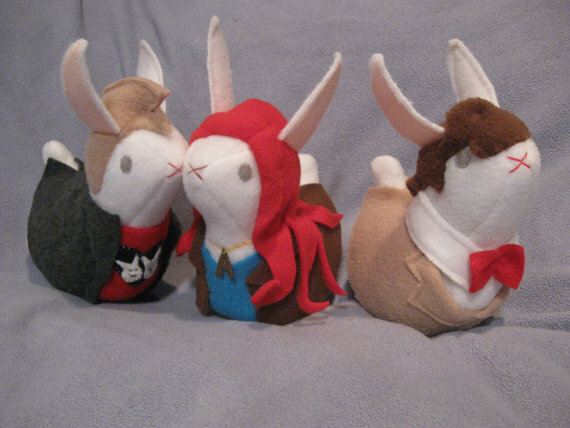 She made the cast of Doctor Who into bunnies which...I'm sure someone has done before but perhaps not quite like this? Either way, they're adorable. Hit the jump for a few more cast members plus a Harry Potter character who isn't an animagus that wound up turning into a bunny, and some other characters you may be familiar with who have yet to make the bunny jump. Redditor Linksawake took his pets, a bunny and puppy, and turned them into the iconic Valve logos. You know the ones, with the valve sticking out of the back of the guy's head, and poking out of the other guy's eye socket? 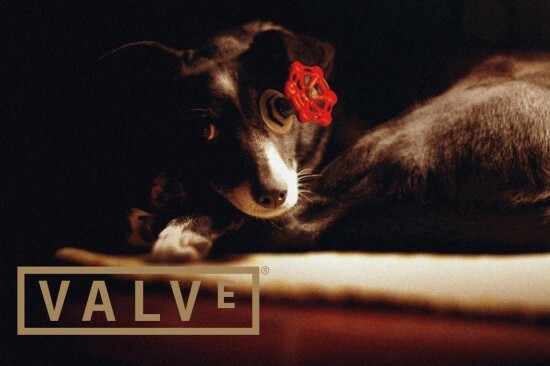 This time it's a bunny and puppy though, so it's adorable, and also you probably like Valve. Linksawake also made a video of the Valve splash screen, complete with the valved bunny and valved puppy coinciding with the iconic Valve brwoaw sound effect. That's how you spell that. Check it out after the break. A bunch of puppies frolicking with baby chicks and bunnies. You're welcome. Hello, Internet. Today is as good a day as any to be sad about things, so why not be sad about the death of both Yoda, 2011's world's ugliest dog, and an adorable mutant earless bunny? One of them died a peaceful death, at least, while the other one died a very quick, albeit ridiculously tragic death. Mark Meyerhoff and his colleagues have made a discovery that could potentially revolutionize the treatment of diabetes: Tears can be used to track blood sugar levels. As I'm sure you are aware from those commercials involving B.B. King, for the moment, diabetics who need to check their blood sugar (as they frequently do) are stuck with the current, inconvenient solution of pricking their fingers and drawing literal blood to test. Granted, it's not always the fingers, but the fact remains that diabetics have to make themselves bleed on a daily basis just to get by. Meyerhoff is hoping this discovery will change that.